Pro-Ject Optical Box E Phono Stage is a multi-purpose phono preamplifier with Analogue/Digital conversion and 2 output options; Line level and digital optic. Music lovers who want to combine their record player and devices with digital inputs only, such as home cinema receivers, soundbars or all-in-one systems will love this little box. 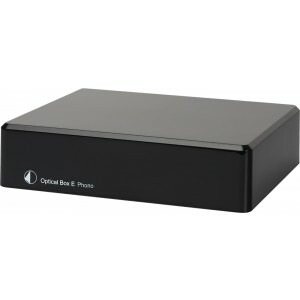 The Optical Box E Phono takes many needs into account and offers a digital optical signal output plus a standard analogue output that will work simultaneously. Therefore it can be used as the perfect signal splitter 1>2 to play the same signal on 2 systems at the same time. Another very useful purpose of Optical Box E Phono is that can act as input expander, for a system with a shortage of inputs. Optical Box E Phono is able to digitise not only phono sources but also line signals from tape decks, tuners etc. To ensure that the incoming signal is maintained as unadulterated as possible, the A/D conversion is done in highest precision with 24bit/96kHz resolution. It can also be used as an ordinary MM phono preamp with line output (3.5mm jack) that integrates into any HiFi system. The internal part of the housing is lined with metal, thereby eliminating RF interference and vibrations, so that an undisturbed listening experience is guaranteed. The Optical Box E Phono is the perfect partner for all modern Audiophiles who want to use their analogue signal sources with digital or analogue playback devices. Best cheap way to integrate your turntable analog sound into digital !